Time to sell your Regency Towers condo? Read about today's resort-market buyer. Situated on the crystal-white sands of Pensacola Beach, the Regency Towers luxury condos overlook the emerald-green Gulf of Mexico waters. The two towers are comprised of 125 spacious units, with either one-, two-, or three-bedroom options. Enjoy stunning views of the Gulf of Mexico shoreline from your private balcony! The Gulf-front pool is surrounded by an expansive gated sundeck, a picnic area, and a private boardwalk that leads down to the Gulf-side beach. Just across the street are the calm waters of the Santa Rosa Sound. Stay active and swing by the private Regency Towers clubhouse to work out on state-of-the-art gym equipment in the fitness center or head out to the tennis court with a partner and play a game together. Step right out your door in the morning and hit the beach for a morning run while the sun rises! Regency Towers also offers a coin-operated laundry facility on site. 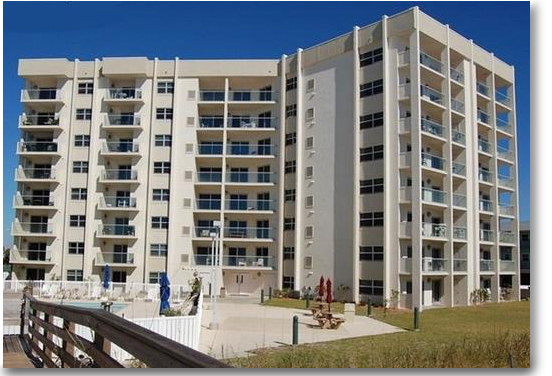 Regency Towers is just minutes away from the famous Pensacola Beach Boardwalk. Head over and enjoy some fresh seafood, beautiful views of the Santa Rosa Sound, and a cold cocktail. While you are there, head over to Key Sailing to book a dolphin cruise or arrange for the whole family to go parasailing. Take advantage of the famously good fishing found around the Gulf of Mexico and set up a deep sea fishing adventure at Entertainer Charters. Enjoy the fishing trip of a lifetime that the whole family will enjoy! Don’t forget to check out the natural beauty of Pensacola Beach. With large stretches of undeveloped shoreline, the Gulf Islands National Seashore is the perfect place to talk a long, quiet walk along the shore while you admire the natural wildlife and hunt for seashells. To get a taste of the rich history of Pensacola Beach, Fort Pickens is less than half an hour away. The pentagonal fortress was built in the early 19th century to protect Pensacola Harbor. Today, visitors can visit what remains and immerse themselves in one of the most historically important spots along the Gulf Coast. Residents and visitors alike will tell you that Regency Towers in Pensacola Beach is the perfect spot for a memorable beach getaway! Please let us know if you would like further information for Regency Towers or any other condos, homes, or real estate along the Gulf Coast or would like to schedule a private viewing by emailing info@condoinvestment.com.